It would appear that the business interests of Israeli companies are given priority over Canadian consumers' right to information on the origin of goods. With the recent flip-flop of the Canadian Food Inspection Agency (CFIA) on the labelling and sale of West Bank wines in Canada, it's easy to wonder whose interest the agency serves. On July 6, CFIA issued a directive to all Canadian liquor boards which some interpreted as necessitating a ban on the sale of two wines that CFIA considered falsely labelled as "Made in Israel." CFIA made a compelling argument, citing Canada's Food and Drugs Act, and the Government of Canada's official policy on the status of the West Bank. This decision was triggered by a formal complaint launched by Dr. David Kattenburg of Winnipeg, and affected wines from Psȃgot Winery Ltd. and Shiloh Winery Ltd. In his complaint, Kattenburg demonstrated that both wineries are operating in the West Bank, and not in Israel proper, and neither winery uses grapes harvested in Israel, in violation of CFIA labelling regulations. "It's an open and shut case," said Kattenburg after the initial decision. "Just as Canadian consumers wouldn't want to find out that a wine labelled 'Made in France' is produced from grapes grown entirely in Romania, they should know that these wines are not produced from grapes from Israel." But yesterday, CFIA reversed its decision, citing a provision in the Canada-Israel Free Trade Agreement (FTA) whereby "Israel" is to be considered "the territory where its customs laws are applied," rather than the actual territory circumscribed by its internationally recognized borders. As such, in the justification of its reversal, CFIA never asserts that the wine came from grapes grown in Israel. Rather, it determined that the Canada-Israel FTA simply trumped standard Canadian inspection standards. The CFIA reversal by the Trudeau government reveals a number of contradictions with its own official policy. For a neutral observer, it would appear that the business interests of Israeli companies are given priority over Canadian consumers' right to information on the origin of goods. Not what most Canadians might expect or desire. Dr. Kattenburg's legal counsel, Dimitri Lascaris disagrees with CFIA's conclusion. He argues that the section of the FTA cited by CFIA is limited in scope to questions of trade. "The purpose of the FTA is not to regulate product labelling," he explains, "But to eliminate or reduce barriers to trade in goods." Indeed, Dr. Kattenburg's complaint does not argue that the wines must be barred from entering Canada or must be subject to a higher tariff. Rather, he simply insists that if these wines are sold in Canada, they must be compliant with Canada's labelling standards. In fact, Kattenburg's complaint suggested that the wines in question be more truthfully labelled as, "Made in Ma'ale Levona settlement, Occupied Palestinian Territories," and "Made in Psȃgot settlement, Occupied Palestinian Territories." 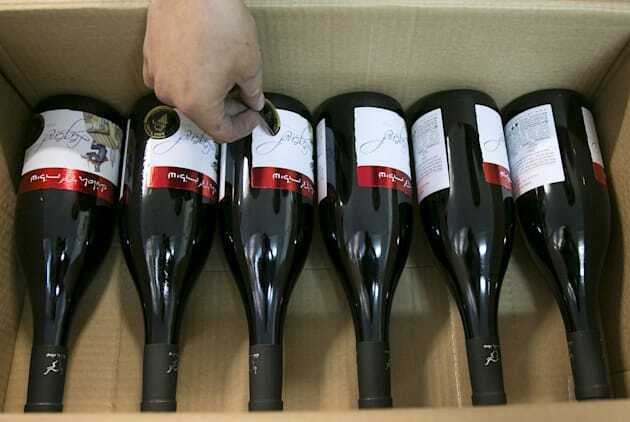 A worker places stickers on wine bottles while packaging them for export at Shiloh Wineries, north of the West Bank city of Ramallah Nov. 8, 2015. The CFIA reversal by the Trudeau government also reveals a number of contradictions with its own official policy. For example, the government and all of Canada's major political parties talk of support for a "negotiated two-state solution." Yet CFIA's interpretation of Canada's trade agreement with Israel clearly confers de facto sovereignty of Israel over the West Bank -- land slated to become part of the future Palestinian state. Simply stated, CFIA's interpretation of the FTA allows Israel to put its name on products produced outside its own territory, an approach that clearly flies in the face of Canada's stated commitment to a negotiated two-state solution. Or consider it from a legal angle. Under international law, countries that militarily occupy foreign territory are not allowed to colonize that territory with their own civilians: a principle that Israel, its West Bank colonies and wineries are clearly violating. This principle is established via Article 49 of the Fourth Geneva Convention, and is incorporated into Canada law via the Crimes Against Humanity and War Crimes Act of 2000. In addition, Canada's official policy on Israel-Palestine explicitly rejects Israeli control over the West Bank. But again, CFIA's latest interpretation blithely dismisses all of Canada's legal positions on Israel-Palestine. CFIA's most recent flip-flop further entrench the impression that the Trudeau government is no neutral bystander to the Middle East conflict. It's fair to wonder how Israel's customs laws actually came to be applied in the West Bank. In fact, this is a legacy of the 1993 Oslo Accords, whereby Israel assumed customs responsibility for the West Bank and Gaza as a way to prepare for a two-state solution. Even though Oslo clearly failed, Israel retains this role primarily because it's the dominant military force. The Palestinians don't like Israeli customs control over the West Bank any more than Canadians would like U.S. customs control over Canada. But as an occupied people, the Palestinians aren't given a choice. As such, Canada's failure to reconsider its definition of "Israel" from the 1997 FTA signals implicit acquiescence to Israel's ongoing military dominance. A child of Holocaust survivors, Dr. Kattenburg launched his complaint against CFIA because of his concern that the agency was reinforcing Israel's de facto annexation of the Palestinian West Bank. In his words, all of CFIA's actions "gave the lie" to Canada's stated support for a two-state solution. CFIA's most recent flip-flop and legal contortions only further entrench the impression that the Trudeau government is no neutral bystander to the Middle East conflict. Worse, not only is the Trudeau government favouring Israel over the Palestinians, it's also favouring Israeli business interests over the consumer protection of Canadians.